Alfaro is a city and municipality within the autonomous region of La Rioja. Alfaro is in the east of the province, in the Lower Rioja area. It is the main city in the district of Alfaro and the largest municipality in the whole of La Rioja; it borders the autonomous region of Navarre. On the 1 January 2009, the population was 9,883 according to data from the Spanish national institute of statistics (INE). It is the fifth most populated city after Logroño, Calahorra, Arnedo and Haro. The River Ebro crosses the north of the municipality and the River Alhama flows into the Ebro having encircled Alfaro to the west. -Area: It is part of the district of Alfaro. -Economy: The area's biggest industry is food and agriculture with around,60,000 hectares of irrigated land, where fruit and vegetables are grown. Secondary activities include a large canning industry and wood and furniture businesses. Chair production is particularly important and so are products connected to the construction industry: tiles and bricks. The tertiary sector and industry are also important in Alfaro. 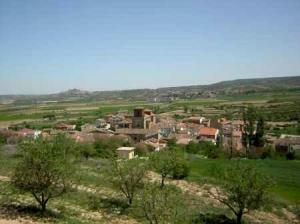 Arnedillo is a municipality within the autonomous region of La Rioja. It is in the Lower Rioja region, just a few kilometres from Arnedo, between the Hez and Peñalmonte mountain ranges. The River Cidacos crosses the municipality. The area is well-known for its natural thermal baths that contain hot water filtered from deep down in the earth. This water is used by the spa which is on the right-hand bank of the river on the outskirts of the town. Santa Eulalia Somera is a district just 5 km from Arnedillo next to Santa Eulalia Bajera. It is part of the municipality of Arnedillo. -Location: It is part of the district of Arnedo. -Populated areas, neighbourhoods or villages: Santa Eulalia Somera. -Economy: The thermal spa in Arnedillo attracts tourists to the area and this is the main source of income. The municipality's orography means that there is little crop or livestock farming. 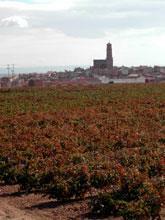 The city of Arnedo is in the Lower Rioja region of La Rioja and has a population of 14,548. The River Cidacos runs through the municipality. The city's economy centres on the shoe industry. The name Arnedo possibly comes from the Latin Arenetum, collective noun for sand. -Location:It is part of the district of Arnedo. -Populated areas, neighbourhoods or villages: Turruncún. 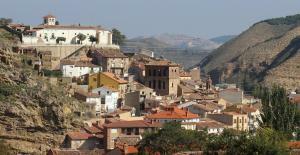 -Economy: Arendo is one of the most prosperous towns in La Rioja. Industrial activity is high, particularly in the shoe sector, which is a tradition inherited from the previous century. The main crops farmed in this area are typically Mediterranean, such as grain, grapes, olives and also fruit and vegetables. The Kan de Vico Medieval market is held in September. Ausejo is a municipality in the autonomous region of La Rioja. -Location:It is part of the district of Calahorra. It is on the right bank of the River Ebro in the area called Ocón. -Economy: The main activity is farming, particularly asparagus, mushrooms, grapes and other fruit. Autol is a municipality within the autonomous region of La Rioja. There are around 5,000 inhabitants and it is one of the largest towns in La Rioja behind the region's main cities. Autol is 458 metres above sea level and the left-bank of the River Cidacos crosses the area. Here the river meets the northern point of the Yerga Mountains and is forced to meander around Autol's town centre. -Location: It is part of the district of Calahorra. To the north it borders with Calahorra along the Agudos Mountains and the Yerga Mountains stand to the south. The town is in a narrow gorge through which the River Cidacos flows, carved out of the rock that forms the Arnedo Valley. -Economy: Farming is the main activity, particularly irrigated crops and a canning industry. Mushrooms are one of the main products. Bergasa is a municipality in the autonomous region of La Rioja. It is 10km from Arnedo (the district's main town) and 43km from the region's capital city, Logroño. -Location: It is part of the district of Arnedo. It is in the foothills of the Bergasa Mountains. 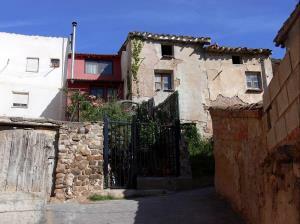 -Populated areas, neighbourhoods or villages: Carbonera. -Economy: The main activity is farming: wheat, grapes, olives and almonds. Sheep and goats are also farmed. Bergasillas Bajera is a town and municipality in the autonomous region of La Rioja. -Economy:The main activities are crop and livestock farming. Calahorra is a Spanish city in the autonomous region of La Rioja and part of the Lower Rioja area. The population in 2012 was 30,000 according to data from the Spanish national statistics institute (INE). The town measures 91.41 km² and the population density is 264.9 inhabitants /km². The city holds the titles of Very Noble, Very Loyal and Loyal City. Since the 4th and 5th centuries, it has been the diocesan headquarters of Calahora, which in the past extended all the way to the Bay of Biscay. It is the second most populated and second most largest city in the autonomous region after Logroño. It is the capital of the Lower Rioja district and is known for its farming and antiquity. It was an important Roman city called Calagurris Nassica Iulia and it minted money until the Middle Ages. In addition, Calahorra was the birthplace of the grand oratorical master Marco Fabio Quintiliano, the author of several texts and master of the Roman court. There is a statue in his honour opposite the Town Hall. -Location: It is part of the district of Calahorra. The municipal area covers the region where the Rivers Ebro and Cidacos converge, forming a large river plain. 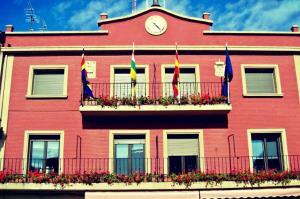 -Populated areas, neighbourhoods or villages: Murillo de Calahorra. -Economy: It is the main social and financial centre of the Lower Rioja region and the most highly populated municipality in the region after Logroño. Population numbers have risen during this century due to its status as city and the boom in its farming, industrial and commercial activity. The city's wealth is mainly due to farming and industrial development and a significant increase in tertiary sector activity. Farming is mainly irrigated and the produce supports the canning industry. The main products grown are fruit and vegetables and they always feature strongly during the annual fruit and vegetable show and the culinary conferences that are organised. Secondary industries include all kinds of businesses, such as canning, wood, packaging, shoes, etc. In terms of the tertiary sector, the city serves neighbouring villages and several municipalities in Navarre, providing different services including schools, a hospital and all kinds of businesses. Cervera del Río Alhama is a municipality in the province of La Rioja, Spain. The town is in the southeast of the region at the foot of the Alcarama Mountains, covering 152.6 km². Other towns such as Cabretón, Aguilar, Valverde, Fitero and Cintruénigo are close to Cervera del Río and the town itself is around 30 km from Tudela and 87 km from Logroño, via Arnedo and Grávalos (100 km if you go via Calahorra). The town is on the banks of the River Alhama at around 550 metres altitude. It has two neighbourhoods (Santa Ana and San Gil), which are separated by the «La Peña» Mountain, upon which stand the ruins of the castle. -Location: It is part of the district of Cervera del Río Alhama. 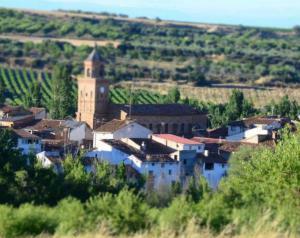 The municipal area is in the southeast of La Rioja and is spread out over the Fío, Anacueza, Alhama and Canejada Valleys. -Populated areas, neighbourhoods or villages: The neighbourhoods of Rincón de Olivedo, Valverde, Valdegutur, Las Ventas de Cervera and Cabretón are nearby. -Economy: Traditionally, Cervera's economy was based on the textile and shoe (espadrilles) industry, but from 1950 onwards an industrial crisis caused population numbers to drop. Furthermore, tax benefits offered in Navarre to set up industries meant that many people left Cervera to go to Navarre. Farming is currently the main activity: the main crops are wheat, grapes, barley, fruit and vegetables. "Corera is a municipality in the autonomous region of La Rioja in the Ocón Valley. The small municipal area covers 8.21 km2. Corera is under the local jurisdiction of Calahorra. It stands at an altitude of 522 metres. Staggered levels of glacis plates make up the surrounding landscape. -Location: It is part of the district of Arnedo. The municipality is surrounded by the Ocón Valley. -Economy: The main activity is farming, particularly barley, grapes, olives, almonds and fruit. "